Want more details about assessment results and how to advise Discoverers? Go to Advise Discoverers. Each gives you a different level of visibility and different insights. If you take a moment to get familiar with them, you’ll get the most of Career Key Central. Take the Assessment: in only ten minutes, discoverers start learning more about their personality. Discover Options: Explore career options, education options or both that match their top personality types. Identify options they want to learn more about and save and return to in their Profile. Research and Make a Decision: Take action to learn more about and modify over time their list of saved options in their Profile. Consider the big picture to evaluate options and make decisions, including pros/cons and consequences to themselves and significant people in their lives. Plan and Prepare: Make plans to carry out their decision. Read Discovery Step-by-Step for a little more detail about each step. When you first sign into Career Key Central, we show you the big picture of your account activity in three boxes: Discoverers’ Progress, What’s Happening, and Let’s Connect. Not Yet Started: discoverers who have been uploaded into Career Key Central, and any who have started but who have not yet completed the assessment. Completed Assessment: discoverers who completed the Career Key assessment but have not yet added any matching careers or education programs to their list to explore in their Profile. Started Profile: discoverers who have added at least one career or program to their list of options to explore in their Profile. Returned to Profile: discoverers who have exited Career Key Discovery and returned at least once to review their assessment results and Profile list of options. When you click on the action above each circle, you are shown the list of discoverers who achieved that level of progress. Select a bulk action, like a Let’s Connect email to follow up and encourage them to continue moving forward. Learn about recent activity by your organization in Career Key Central. This is your communications hub where you follow up with discoverers using email templates we’ve designed for you or a custom message you create. Here we display the most recent messages you and your colleagues have sent to discoverers. You can handle discoverers in two ways, depending on whether you’ve identified them ahead of time, or they organically find and start using the CKD app on your website. You can also assign a group to a particular counselor at any time. For programs where you know ahead of time who the discoverers will be, like a freshman orientation class or a marketing list of potential college applicants, you can create and upload a group of discoverers using a .csv file. Discoverers may also organically find (or you direct them to) the CKD app on your organization website through the site’s navigation. In that case, as they complete the assessment, discoverers will appear in your Career Key Central. These discoverers are not in a group and are unassigned to any of your organization’s users (Owner, Counselor). As they arrive, you can assign them as a bulk action to a group. Once you have a group you can assign that group to a Career Key Central user. Using groups and assigning them to your organization colleagues (users) is easy. That way they can focus on viewing and supporting the discoverers most relevant to them. You can assign each group of discoverers to one or more Career Key Central users, like a counselor . If you are going to advise a discoverer either on the phone or in person, you will want to look up and review their CKD results in Discoverers & Progress. Use the search box to the right to look up a discoverer by name. Click on the name to show Discoverer Detail. Personality pattern: their scores in all six Holland personality types/environments, highest to lowest. Profile: the careers and education programs that interested them to learn more about. More features help you understand results and follow up with the person. Take notes that you and your colleagues can refer to. Basics about Assessment Results: Discovery Process Step-by-Step > Assessment. Advice recommendations: About the Assessment > Understand Results and Advise Discoverers. You can then assign them to a group and send a targeted, relevant message to them. Judy, an admissions advisor at her college, filters all discoverers by RIASEC personality type Enterprising (E). She assigns them to a group she’s created called Enterprising Potential Applicants 2019. (see Organizing As You Go: Create and Manage Groups). She clicks on Bulk Action and selects Let’s Connect to create a custom email message. In the message, she congratulates them for learning about themselves with CKD and provides them information and links about her college’s enterprising programs, like business administration and entrepreneurship. With Career Key Central’s engagement hub Let’s Connect, you can follow up with discoverers at the right time with the right information they need to choose a career or program. You can also see if your fellow users have contacted someone, so you can coordinate your efforts. 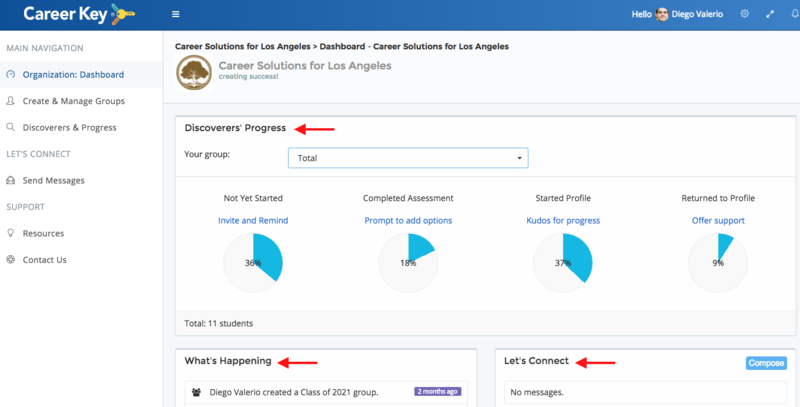 You can send an email to a discoverer or group from nearly every part of Career Key Central, including your Dashboard, Discovers & Progress, or from the Discoverer’s Detail. While the emails come from Career Key, the discoverer replies to you directly, at your email address listed in Career Key Central. Career Key does not contact your discoverers except as you initiate through Let’s Connect in Career Key Central. Let’s Connect keeps track of all the emails you or another user send to a discoverer. You can see these on your Dashboard, Discovers & Progress, or in the Discoverer’s Detail. The Last Contact column in Discoverers & Progress also lists the date of the last email your organization sent.